The Teutonia line of strollers introduces a whole new way for your baby to ride. Or is it a whole new way for you to shop for strollers? A little bit of both, really. Unlike most stroller systems where you have to just take what you’re given, the Teutonia line is completely customizable. From the color of the seat to the style of the wheels — and everything in between — choices are both plentiful and practical. Let’s say you’re shopping for a toddler… well, you don’t need a bassinet so why pay for one? So skip it. Like girly colors, but might have a boy in the future? Get a neutral seat color and embellish it with a flowery cushion. You even have three chassis choices so you can select one that will be most appropriate for your lifestyle. All of the Teutonia chassis options allow for the seat to be positioned either forward facing or reverse. (I love this feature!) And the same seat will work on any chassis, so if you’re like some moms I know, you might buy more than one chassis and keep one in the car. You can buy everything all at once, or add to your system as baby grows. The folks at Teutonia really have thought of everything. I tested a T-150. In Teutonia-speak, that means I tested a t-100 chassis ($425) with explore-50 heels. I added a t-sStroller seat ($150) in Jasper Brown and a pretty flowery t-duo cushion ($60), too. There are two other stroller chassis options: the T-200, which is a sporty all-terrain 3-wheel base perfect for urban (bumpy) sidewalks and dirt roads, and the T-300, which has a reversible handle. So easy. Just unfold the stroller, click on the front and back wheels, snap on the sun canopy and you’re ready to roll. Because of the independent wheel suspension and the ball bearing construction it really doesn’t matter which Teutonia chassis you choose, you’re going to have a smooth ride. The wheels are air-filled, but are tubeless and require no maintenance. The handlebar is adjustable to 12 different positions so anyone can push the stroller and feel comfortable doing so. It turns on a dime. I absolutely love pushing it because it’s just so easy to maneuver… even if I have only one hand free to do so (which happens more often than I would like!). My combination weighs 30.2 lbs and, while not the lightest stroller around, is in no way difficult to lift up and down stairs. The t-stroller Seat (which comes with a rain cover) is a great seat. My children (a one-year-old and a four-year-old) can each (though not at the same time) fit comfortably into it. The recline is adjustable with one hand and the water-resistant canopy has all kinds of positioning options including a neat zip-away part that reveals ventilation mesh for hot summer walks. The buckle, which is different from any other I’ve used, is 5-point, but has five separate straps that you connect as you put the child in. Sounds complicated, but I actually prefer it and it makes things easy when you have to add accessories (say, a foot muff) to the stroller. I have found that things get a bit squishy in the seat when dealing with foot muffs and winter coats, but aside from that, I love it. There is lots of space in the under-seat storage and is easy to access, whichever way the seat is facing. The canopy fabrics all have UV 50+ protection and pull down easily to cover baby without blocking too much of their view. The highlight of the fold for me is that it folds with the seat on unlike some other high-end strollers where the seat has to be removed. Of course, you can also fold them without the seat if that’s preferable. Folding is easy — just pull up on the fold latches and the stroller pretty much folds in on itself. The handlebar folds under, you fasten the buckle locks and you’re set. Teutonia accessories are plentiful, to say the least. From the brilliant (so, so brilliant!) t-handmuff ($60) — you can see our review here — to the beautiful t-duo cushions, there are lots of neat items you can add to customize your Teutonia stroller. My daughter loves the t-footmuff ($80) and has asked for it specifically when we’ve been out on cool days. And the t-winter footmuff ($100) is a thicker, warmer option for chilly climates — so warm and cozy. There’s a t-carseat adaptor ($40), a diaper bag (currently free with a stroller purchase) and even interchangeable liners ($55) for the t-carrycot ($150). These accessories are all optional add-ons to a basic stroller. Included with the t-stroller seat is a raincover and included with the t-tario car seat is a mosquito net cover and a cold weather boot. Because you’re custom designing your stroller from the wheels up, you can add (or omit) any accessories you like. Step 1: Build. Choose the chassis (three to choose from), wheels (explore-50, metro-60) and your seating options (3 to choose from: t-tario/infant car seat, t-carrycot, t-stroller seat). Step 2: Design. Choose your fabrics — 9 solids and 3 designer prints every season. 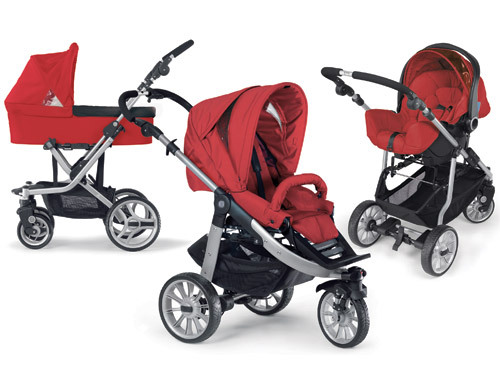 Teutonia strollers are currently only available in stores. Because the process of creating your own stroller is a new one in North America, Teutonia wants customers to be able to work with experts in the stores when designing an ideal stroller to fit their lifestyle. A visit to their website, however, will give you lots of details about the strollers and show you why celebrities like Minnie Driver and Constance Zimmer love theirs. Obviously, a Teutonia is a luxury purchase, but from a mom of two (one who even does a LOT of babywearing), I cannot say enough about how a great stroller like a Teutonia will make a huge difference. You’re going to use this thing every day for the next three or more years. It might as well be excellent quality and easy to push. If you get to design it to be exactly (and I really do mean exactly) what you want, all the better. And if it just happens to be as gorgeous as a Teutonia, too? Well that’s just the icing on the cake!